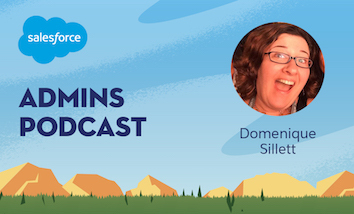 Today on the Salesforce Admins Podcast we talk to Domenique Sillett, Senior Creative Director at Team Trailhead at Salesforce, to find out about the creation process of all the Trailhead characters you know and love. 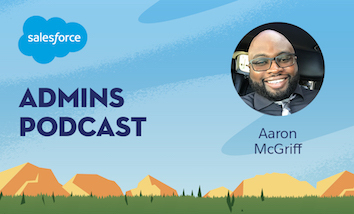 Join us as we talk about the origins of the Trailhead cast, including Astro, Codey, Einstein, Earnie, Meta, Hootie, Blaze, and more. You should subscribe for the full episode, but here are a few takeaways from our conversation with Domenique Sillett. Not just another tech company. Domenique and her team are responsible for a lot of things we know and love like the Trailblazer hoodie, the amazing cast of characters, and all the badges you earn on Trailhead. They also play a key role in organizing events like TrailheaDX. “You go to all these different shows and they all start to look alike,” Domenique says, “they’re all kinda of techy looking and they talk about how they’re number one. But with everything we do at Salesforce, we’re trying to show you that we’re a different kind of tech company.” That kind of thinking is how we end up with waterfalls and goats inside of Moscone. From a guy in a bear suit to a colorful cast of characters. “Earnie Badger came about in a really fun way because we were creating a badger character for breakfast at Dreamforce,” Domenique says. “We just said that you can’t have a breakfast without a badger,” which is why you see Earnie with a stack of delicious cloud cakes. Trailhead naturally had always had a running thing with badgers (and puns), so it made sense. “These conversations turn into things,” she says, and characters like Meta the moose and Blaze the wolf got their start through these random chats that turned into ideas. Blog: ? Happy birthday dear Astro ?…and the real story behind all the Salesforce characters!